I thought about writing this up last night after the live stream with Kevin Smith, but I wanted to sit on it. I wanted to let my brain take in all that I saw. There was so much information thrown at you in the roughly two hours the live stream played. Let’s start with some of the highlights I remember. Not to bury the lead, but the service launches on September 15th. This man is a treasure. He’s always so enthusiastic I love it! The biggest shock to me wasn’t that he is going to be a host on DC Daily, a show I legit plan to watch (but I’m sure I will forget to watch it every day because you know, life), so that wasn’t a shock. I know he’s a big fan of comics so I’m sure he jumped on this. What shocked me was that his hair is totally white! I know, stupid thing, but I did NOT expect that! In the shows it’s always so dark! I’m excited for what he brings to the team at DC Daily. Kevin Smith is a wonderful host, as we all know. He handles the MC duties elegantly and refrains from all adult humor jokes. Ok, not really, but he is amazing to listen to. He spews positivity and love of the medium of comics from his sweat glands. Even if he did ghost us to be on our 100th episode (not bitter at all), he has bigger and more amazing things to do, like this! How can you not want to join the DC Universe service after hearing this man gush about it for two hours? THEY ARE DOING A DOCU-SERIES ON GEORGE PEREZ! Oh my god I am way more excited about that than I should be. They played a clip from it and I can’t wait to watch move. I really hope they do more of these on other classic and modern creators. Hey DC, if you need more people to work on these documentaries let us know, we would love to work on some! Just saying. Not sure what else I can say about this service. I signed up at San Diego Comic Con and got my T-Shirt and my 3 extra months. I can not WAIT for this to launch to bing comics I want to read and watch some TV Shows I never got to see. I am not getting paid to say any of this, nor is DC giving me anything to report on this. This is all because I am genuinely excited for the service! Even if they didn’t have new exclusive shows coming out I would be all in on this! The new shows are just a bonus for me. Let’s look at some fun stuff the DC Universe team sent us. Here’s an exclusive new clip from the NEW Young Justice: Outsiders show! Hot damn I can’t wait to watch this! Young Justice was a show my eldest son and I bonded over, we loved it and watched it when it came out! I can’t wait to make my 16 year old sit down and watch this with me! Just released are these amazing new images from the TITANS show! I know there are those out there with concerns over costumes and the look of some of the characters (we even talked about it on an entire episode) I am excited for this and will give it a chance. My bet is I will love it. 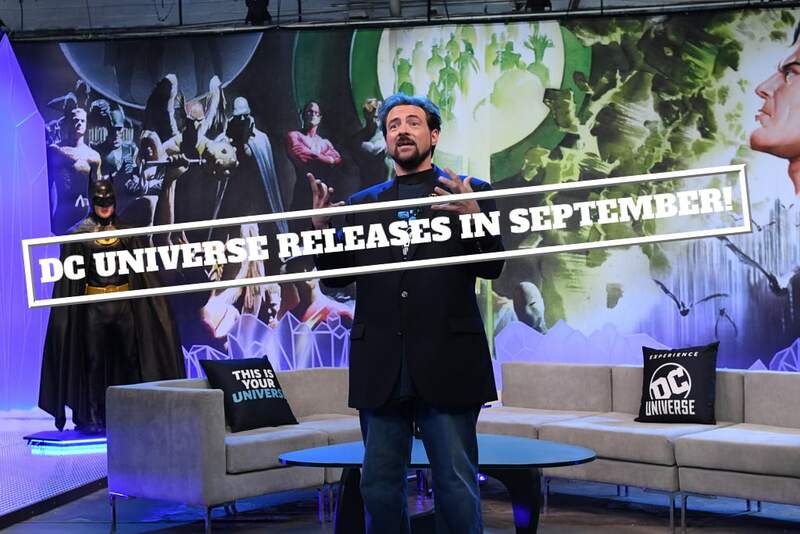 Want to read the whole release from DC Universe? Check it out here on their blog or expand below! BURBANK, Calif. – August 29, 2018 – The countdown to DC UNIVERSE is down to weeks. To celebrate Batman Day on September 15, 2018, DC UNIVERSE will launch a first-of-its kind digital subscription service to fans across the U.S. In addition, the debut date of the exclusive original series Titans was announced as October 12, 2018, with episodes released weekly on DC UNIVERSE. The first season of Titans will consist of 12 episodes. Warner Bros. Television will host a world premiere screening of Titans on October 3, 2018, in conjunction with New York Comic Con.